The Charlottenborg Foundation and Kunsthal Charlottenborg are finally ready to open the doors to Charlottenborg Spring Exhibition, one of the most important open and censored exhibitions in Europe since 1857. The opening takes place on Friday 1 February 7pm-12am, the exhibition closes at 10pm. The admission is free and everyone is welcome. 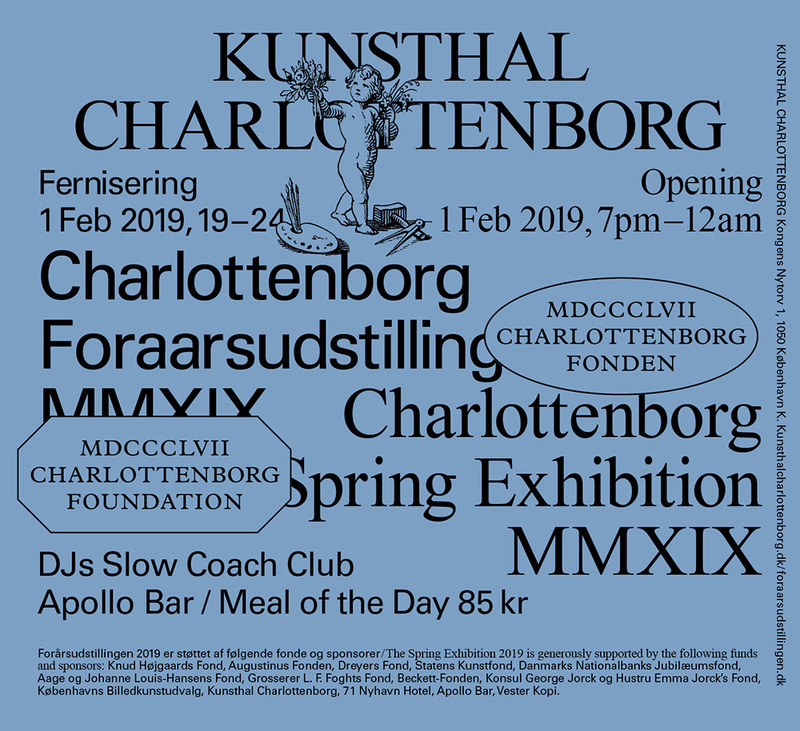 It is with great pleasure that the Charlottenborg Foundation and Kunsthal Charlottenborg invite to the opening of the Charlottenborg Spring Exhibition 2019. The opening will take place this Friday 1 February 7pm-12am (the exhibition closes at 10pm). At 7.30pm there will be a welcome speech by Thomas Lindvig, Chairman of the Board, the Charlottenborg Foundation. Following, architect Linda Korndal will give an opening speech on behalf of the jury, where this year’s winner of the Solo Award will be announced. This year 45 Danish and international artists and artist groups has been selected by the jury among the 657 applications. A total of 78 works are on display this year created by well-established artists, but also by emerging talents from Denmark and Europe as well as Iran, Israel, South Korea, Turkey and USA. Furthermore, last year’s winner of the Solo Award, Kim Richard Adler Mejdahl, presents a new film work DAYS OF AL at the Charlottenborg Spring Exhibition 2019. In 2019 the jury consists of Tove Storch (artist, DK), Anna Krogh (curator, DK), Anna Bjerger (artist, SE), Linda Korndal (architect, DK) and Irene Griegst (jewelry artist, MA/DK), who with their artistic practice and strong international outlook not only have selected the participants for 2019 but also nominated five participants to this year’s Solo Award. The winner is appointed at the opening night. DJs Slow Coach Club provides music all night and Apollo Kantine serves the dish of the day for 85 DKK. Admission is free and everyone is welcome. Further info about the exhibition here.